Home » Alfred the Great. The first English king. Alfred the Great (848/849-899). The first English king. It is scarcely too much to say that the actual history of England commences with the chronicles of the reign of Alfred the Great, since he is the first king with whose personal character and achievements we all seem to have been familiar from the time when we first heard the story of his having left the cakes to burn while he was hiding in the peasant’s hut. Whatever may be the foundation for the legends of Arthur and the Knights of the Round Table, they occupy but a vague place in the imagination, while almost every boy and girl in the country has learned to regard Alfred not only as the first great prominent figure in the history of England, but as an example of courage, diligence, learning, and piety. They have good reasons for so doing; and happily while the records of the reign of Alfred were kept with some accuracy, and have been to a great extent preserved, the biography of the king himself from childhood to the close of his reign was written by one who, though he was a close and constant friend and counsellor, wrote a narrative which was universally accepted as true, and was confirmed by bards, by the public chronicles, and by celebrations of the events which he described (Asser, a Welshman, the most learned man then in the country, and a monk of St. Davids, afterwards Bishop of Sherburn). Vessel from the 9th century. To the steadfast, patient resolution of the Saxon he united a genius for government and a talent for resource and invention, which make him the pre-eminent figure of his time, in the pictures of those conflicts which represent the history of the period from the accession of Ethelred in 867 to the formation of the first English navy, with which Alfred succeeded in more effectually preventing the incursions of the enemy. From mere marauding excursions for plunder, or for the devastation of a portion of the country from which these pirates could escape to their ships on sea-coast or river, the Danes had increased their hostilities till they assumed the proportions of a regular invasion. They held the Isle of Thanet, and so commanded the river Thames and the coasts of Kent and Essex. They had overrun or conquered all Northumbria; had rebuilt the city of York and settled a strong colony there; had desolated Nottinghamshire, Lincolnshire, Cambridgeshire, Norfolk, and Suffolk, and with constantly increasing numbers occupied the whole length of the island on this side the Tweed, with the exception only of the western counties of England; and had established fortified camps between the Severn and the Thames. For seven years a Danish army had occupied the land when Alfred, at twenty-three years of age, came to the throne in 871. The Anglo- Saxon standard had been gradually retreating towards the southwestern corner of the island, and in less than a month after the young king had taken the command he found himself with a small army opposed to a great force of the enemy at Wilton, where the Danes were routed; but discovering the inferior numbers of their opponents again took the field, and were thus able to conclude a treaty of peace. They left the Kingdom of Wessex to turn their attention to London, whither they marched, and being joined by fresh hosts in the following spring ravaged Lincolnshire and Derbyshire, robbing and burning towns and villages, and reducing the people to a condition little short of slavery. For three years the Kingdom of Wessex was tranquil, but in 875 Halfdani was in Northumbria with an army, amongst whom he divided the territory, which they subsequently adopted as a permanent dwelling place, intermarrying among the Saxons, and ultimately forming one mixed population. Meanwhile another army, commanded by three kings, marched upon Cambridge, which they fortified and made their winter quarters. The Anglo-Saxon Kingdoms of Northumbria, Mercia, and East Anglia had been obliterated, and the contest lay between the Danes and Alfred’s men of Wessex (The Comprehensive History of England). During their settlement in England the Saxons, who had themselves been accustomed to use the same skill in seamanship, had entirely neglected either to maintain or construct ships as a means of defence, and Alfred now set himself to provide a few vessels with which to protect the Dorsetshire coast. The result was as successful as to the Danes it was unexpected. Small as the Saxon flotilla was, it attacked seven Danish vessels, one of which was taken, and the consequence was that the enemy once more treated for peace, and agreed to leave Wessex unmolested. 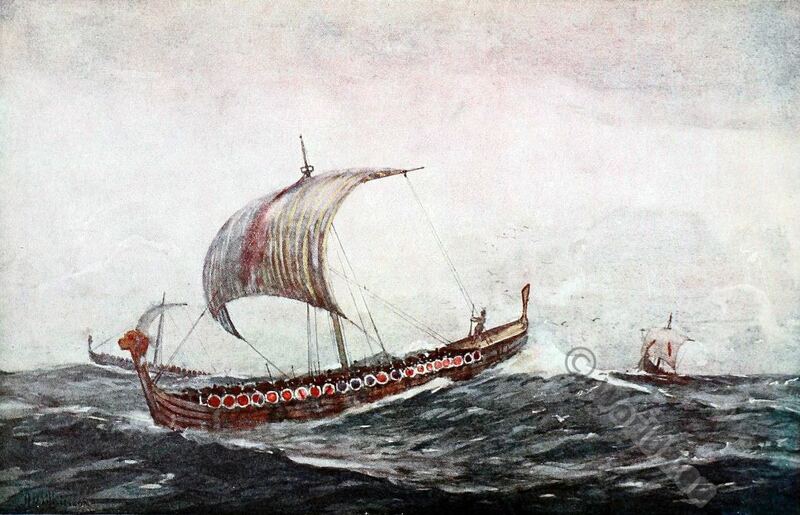 The Danish chiefs promised to maintain this treaty by their most solemn oaths sworn on their golden bracelets, and repeated the pledge when Alfred insisted that they should also swear by the relics of some Christian saints; but the “treaty breakers,” as the Saxon people had learned to call them, observed neither obligation. The very next night they attacked Alfred as he rode with a small body of men-at-arms towards Winchester, and though he escaped, his followers were mostly slain or dismounted, the Danes seizing their horses and riding away towards Exeter, where they joined another body of their countrymen, who had come round by sea and landed at the mouth of the Exe. 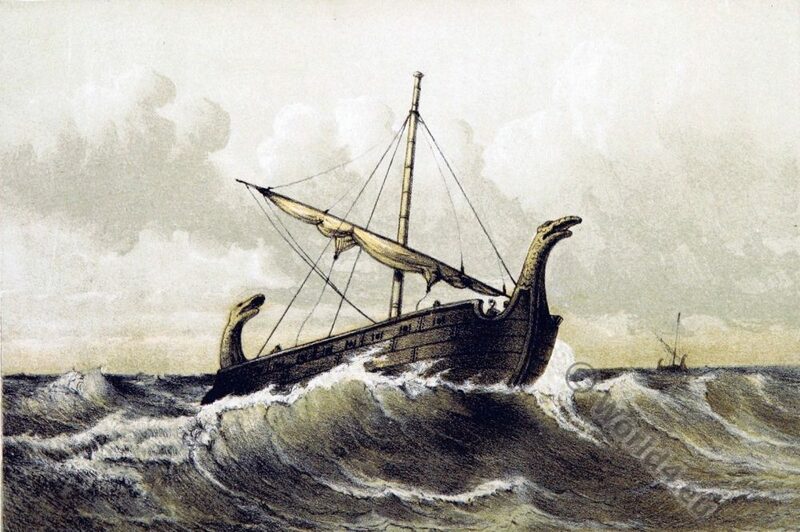 The Danes had planned a combined movement by which they might take Alfred in his western stronghold, and for this purpose, while the King Guthrun held the town of Exeter, a large Danish fleet sailed from the mouth of the Thames to carry fresh forces to the scene of action. But Alfred was able to gain one more great and decided victory before the treachery of Guthrun and the second breach of a solemn treaty by the Danes led to the sudden taking of Chippenham,and the subsequent retreat to Athelney. The English fleet, which had been considerably increased, was still weak, but small as it was, had only been partially manned by Saxon sailors, and the crews were made up of Friesland rovers, whom Alfred had induced to serve him. These men did their work faithfully and well, and were ready to intercept the Danish vessels, half of which were wrecked by a storm which caught them off the Hampshire coast, while the rest coming on slowly, and in a shattered condition, were met by the Saxon flotilla in the mouth of the Exe, and after some hard fighting were entirely destroyed. 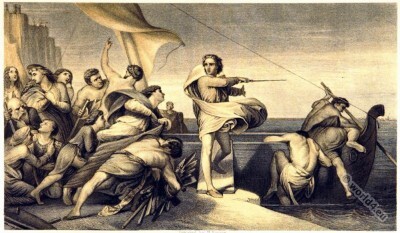 Meanwhile Alfred himself had invested Exeter with his army, and Guthrun, to whom intelligence had been given of the loss of his fleet, was ready to capitulate, to give hostages, and to swear any oaths which were demanded from him before he marched out of the west country into Mercia, to wait for a more convenient time when he might again break all his solemn treaties. The opportunity came quickly, for the Danish general went no further than Gloucester, where he set up his standard, the black and boding raven, around which invading birds of prey gathered from all parts of the kingdom to prepare for another expedition to the west. In January, 878, Alfred was at Chippenham, the residence of the “Kings of Wessex, celebrating the feast of the Epiphany, for it was twelfth night,” and the Saxons were all engaged in observing the festival when a sudden panic overwhelmed them. The Danes were at the gates. Guthrun’s chosen followers, well armed and mounted, were unbidden guests, and had come upon them as it were in a moment, and with an organized plan that gave them no time to make any effectual resistance. The grim foe burst into the streets of the town slaying as he went, and it was only with great difficulty that the king and a small band of followers at last escaped to the woods and moors. Close to the confluence of the rivers Thone and Parret is still to be seen the Prince’s Island or Athelney, and it was there, when the whole tract was covered with an almost impenetrable wood, the abode of wild boars, deer, and forest game, that Alfred was secluded with the few faithful followers who had accompanied him. To a band of huntsmen well skilled in woodcraft, subsistence in such a place was not difficult, and bogs and morass made the place unapproachable except by boats. It was during his concealment here that the king experienced the vicissitudes and adventures which have made his history as romantic as tales of fictitious heroes, and have furnished materials alike for painters and chroniclers. We all know the story of the royal wanderer taking refuge in the swine-herd’s hut, where the good wife left her unknown guest to watch the cakes baking in the embers, and rated him so soundly for suffering them to burn. We can imagine that Alfred was then too preoccupied to think of anything but the masterly stratagem by which he afterwards succeeded in defeating the enemy. His retirement at Athelney lasted about five months, but during that time the place became a stronghold, to which a large number of his trusted followers gathered, and the men of Somerset, Wiltshire, Dorset, and Hampshire soon flocked to his standard in such numbers that he was able to make excursions against the Danes. His hopes began to revive. The attempt of Habba, a Danish chief of great renown, to land in Devonshire had been frustrated. The chief himself and 800 or 900 of his followers were slain, and his magical banner bearing a raven, embroidered by the three daughters of the great Ladbroke, was taken by the Saxons. Alfred believed that the time had arrived to try his strength with Guthrun in a pitched battle, but it was first necessary to learn what was the force and disposition of the enemy. This information the king determined to gain for himself, and the plan which he adopted was an indication both of his personal courage and his eminent and varied ability. Disguised as a minstrel or gleeman, he obtained ready access to the Danish camp, and while he sung songs to the harp and told stories to amuse the fierce but idle warriors in their tents, he not only obtained accurate impressions of the numbers of the enemy, but marked their disorganization and negligence, while he listened attentively at councils and noted their plans. Soon afterwards secret messengers summoned the men of Wessex to meet in arms at Egbert’s Stone on the east of the forest of Selwood on a certain day, and a large and enthusiastic army was there to greet the king, rejoicing in the prospect of once more opposing the enemy at Ethandune (said to be the present Yatton), where, seven weeks after Easter, the Danes were taken by surprise and utterly defeated in a battle which probably took place at Slaughterford on the Avon. A series of victories followed, and the Danes, who retreated to a fortified position, were obliged to capitulate and to accept Alfred’s conditions. There was no hope of expelling his enemies from the country, and he took the course of converting them into friends. The country was large enough for them to settle in it and become its guardians. When once they became attached to the portion of the land which he was ready to cede to them they would take to agriculture, and would in due time embrace Christianity, while there was already so little difference in race and customs between Danes and Saxons that they would rapidly unite in one community. To Guthrun and his followers was given a large tract of country known thenceforward as the Danelagh, or Dane Law, Alfred’s dominion extending to the river Thames and thence to the water of the Lea, “even unto the head of the same water,” and thence straight unto Bedford; and finally, going along by the river Ouse and ending at Watling Street, while the Danes held the territory beyond these lines on the east side of the island as far as the Humber, to which their possessions in Northumbria were quickly added, so that they held the whole eastern part of the country from the Tweed to the Thames. Soon afterwards, Guthrun, relying on the Saxon good faith, went with a few followers to Aulre, near Athelney, and was there baptized, Alfred answering for him at the font, and giving him the Saxon name of Athelstan. Mercia then came under the dominion of the King of Wessex, who gave the military command of it to Ethelred, who had married his daughter Ethelfleda. But there were other hosts of marauding Danes who continually endeavoured to invade England, and it was only during intervals of peace, when these pirates turned their attention to Holland, Belgium, and France, that he had time to prosecute those studies for which he was already distinguished. 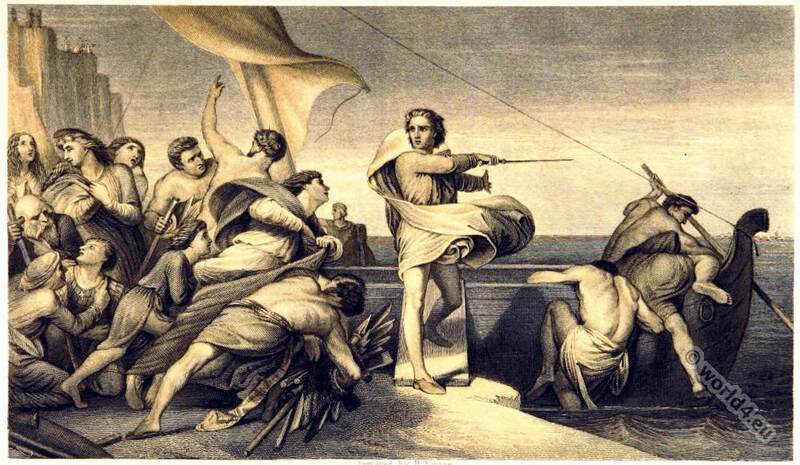 Still devoting his attention to the increase of the navy, he caused vessels to be built far exceeding those of his enemies in length of keel, height of board, swiftness, and steadiness,— some of them carrying above sixty oars, or long sweepers, to be used after the fashion of the Roman galleys when the wind failed. At the end of his reign there were 100 sail of large ships, many of the crews being chiefly composed of Frisians, who fought faithfully. It was to this fleet, as well as to his extraordinary skill and rapidity of action as a general, that we must attribute the series of victories which he gained over the Danes in the enormous invasion under Hasting in 893, when the men of Kent beheld a fleet of 250 vessels full of warriors, and bringing horses from Flanders and France. The army on board these ships landed at Rodney Marsh, towed their light craft four miles up the river towards the weald, and after defeating the fen-men, who were trying to raise a fortress, proceeded to Appledore. Almost at the same time Hasting had entered the Thames with another army in eighty vessels, and intrenched himself at Milton, near Sittingbourne; but Alfred was ready with a strong and well disciplined force, took up a position between the two Danish divisions, and completely out-manoeuvred them both. This was but the beginning of three years of continued hostilities, in which swarms of the enemy came to reinforce the armies, which the Saxons defeated over and over again with great slaughter, both at sea and in various parts of England, and yet Alfred treated his enemies with a nobility, and often with a humanity, which they could at first little appreciate. After the death of Hasting only a few and scattered attempts were made to invade our coasts. Among the recorded benefits assured to his people by the great Alfred was the translation,either by himself or by learned men selected for the purpose, of Latin books into the Saxon language. He was especially fond of studying navigation, geography, and accounts of distant countries, endeavoured by courtesy and generosity to attract foreigners to his court, and his friends made distant and frequent voyages. He may be said, indeed, to have first established English influence in India, for having heard that there were colonies of Christian Syrians settled on the coasts of Malabar and Coromandel, he sent out Swithelm, bishop of Sherburn, to pay them a visit; and the courageous ecclesiastic not only made what is now called the overland journey, but returned with valuable presents of gems and spices. This entry was posted in 9th Century, Anglo-Saxon, England, Genre, Middle Ages and tagged English history, Medieval costume, Pictures and Royal Portraits, Vikings on 5/5/15 by world4.